Fortunately, lately there is more awareness among tourists and backpackers that elephant riding is just plain wrong. If you didn’t know this, have a read here why you shouldn’t ride an elephant. What amazed me though, was that I had no idea what the deal was with other animals in the tourism industry. I cringed with every horse, camel or donkey that I saw being used as a way to generate income (and sometimes I still do). But I didn’t have a clue whether it was ethical to ride an (wild) animal, and I never did any research. When I went to the desert of Jaisalmer, I was confronted with the fact that almost all tours were exclusively offering a camel safari. So, I finally did my research. Then I came across this initiative: SPANA. SPANA stands for Society for the Protection of Animals Abroad. I’m in no way affiliated with them, and I’m not going to ask you to donate (unless you want to, which can be done via their website). What I like is that they have some tips for us travelers and tourists to be ethical with riding animals in the tourism industry. They have a useful guide, namely the Holiday Hooves Ethical Animal Tourism guide. Think of activities like a donkey ride, horse carriage or camel safari. These animals have to work hard and are often not even appreciated. Many are not treated well by their owners. As a tourist, you can positively influence the way owners treat their animals. Choose an animal that appears fit, healthy and in good condition. Consider your own size and weight when selecting an animal (including the weight of other people). Avoid tour operators that overload their camels (or other animals). Praise good tour operators when you see they treat their animals well. Spread the word and tell fellow tourists how they can positively influence the treatment of animals overseas. If you see an animal that needs medical attention, try to contact a local vet. Some will do it for free, but most likely they need a payment. Please read the guide for the tips in more detail! So in short, it is okay to ride certain animals, as long as they are treated right by their owners. However, I’m still not completely convinced whether you can always be completely sure if the animals are always treated well, even if you follow these tips. Maybe it’s just better to not do it. What do you think? Following are some attractions that you should definitely avoid. 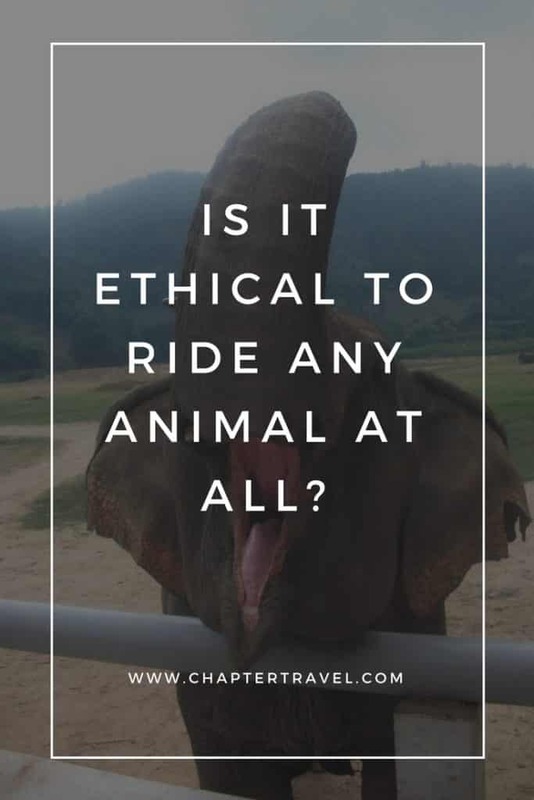 Like I mentioned before, it’s not ethical to ride an elephant. In short, to train an elephant, they are often beaten, abused and starved from when they are still young. It’s a way to crush the spirit of the elephant and make them tame. Once they are trained, the elephants that are used for rides are often overworked, chained up and hurt by their mahout. For instance, they are often beaten with a hook during the ride. Female elephants that are used for breeding are often chained up, without having much room to move. While we were in Nepal, we also visited the Elephant Breeding Centre and were appalled by what we saw. You can read about it in this article (search for Elephant Breeding Centre in the article). There are also other unethical ways elephants are used for financial gain. For instance, by being a circus act, or by being taught how to paint, or how to kiss someone. Or by being on the streets of Bangkok and going on photos with tourists. “Like all wild animals, ostriches avoid human contact in the wild, and they can be seriously injured when forced to carry human beings,” According to PETA Director Mimi Bekhechi (quote found here). Ostrich riding is a big thing in South Africa, but the Association of British Travel Agents say that tour agencies should not offer this. The skeleton of the ostrich is not designed to support a human’s weight, nor is it safe for humans to come close to these animals, as they can viciously attack. So not only is it hurtful for the bird, it’s also life-threatening for people. Another popular tourist attraction is swimming with dolphins. Numerous animal activist groups have called out and claim this to be unsafe and inhumane for the mammals. In this article you can read the story of a former dolphin trainer who is now an anti-captivity activist. Dolphins in the wild can swim over 60 kilometers a day, engage in mating, fighting and play behavior with their pod members, and explore their diverse ocean environment. Captured dolphins are forced to swim in endless circles in a swimming pool, interact with unfamiliar dolphins and other species. Also, they often suffer from stress-related illnesses and are exposed to human infection, bacteria and chemicals. You can read more here. There are many examples of “sanctuaries” in Thailand. Tourists from around the world all dream of that holiday shot with a tiger. However, these tigers are often sedated and live in a small cage. Thus, they barely live the true life of a tiger. They are merely used in a commercial way; get tourists to pay for a photo with a tiger. I’ve also found claims that the tigers are not sedated, but merely used to humans being close and get more active during the nighttime. And that they are in captivity only for their own protection, as they are endangered. To me it just feels wrong that people are able to take a picture with them, and I’ve read some personal stories like this one that makes it seem that is really about the profit and not their well care. Do you know any other attractions we should definitely avoid? It can be quite a struggle. There are so many activities and attractions involving wild life, and often they sound pretty cool. Most wild life attractions are on the bucket list of many travelers, and most people don’t realize that this is actually hurting the animals. Please, don’t let this article make you feel bad if you have done one of these things and you just weren’t aware. Instead, spread the word and make sure it no longer happens. Before you book any tour including wild life, make sure that what you want to do is actually not bad for the animal. For instance, if you were interested in riding an elephant, you would soon find out it’s unethical. So, you don’t have to look into a tour that does that. But, of course you can find an alternative. Such as going to Chitwan in Nepal and hope to see a wild elephant in it’s natural habitat. If you do find an activity that is not necessarily harmful for the animal, make sure you find a tour that is known for treating it’s animals well. It’s still unethical if an animal is being beaten on a daily basis or clearly not fed well. Again, do your research and look for a operator that are actually concerned with the animals well-being. Not only tour companies can mistreat animals. 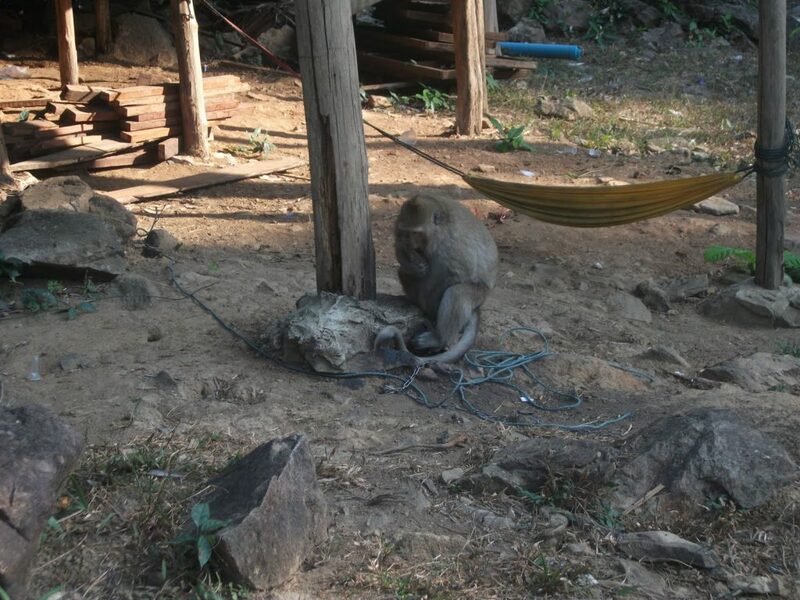 There are also bars and restaurants that may have animals chained up (such as monkeys) for entertainment. Don’t support this by spending your money there, and speak up about your disapproval. If an animal wouldn’t do something in the wild, it’s most likely trained to do it. And unfortunately, these training sessions are often not without suffering. It kinda makes sense that an elephant that can paint has had to endure a lot of training/beating to be able to copy such a human behavior. Also, if an animal is chained up or in a small cage, it is clearly unhappy. What do you think about animals in the tourism industry? Hi. Great post. 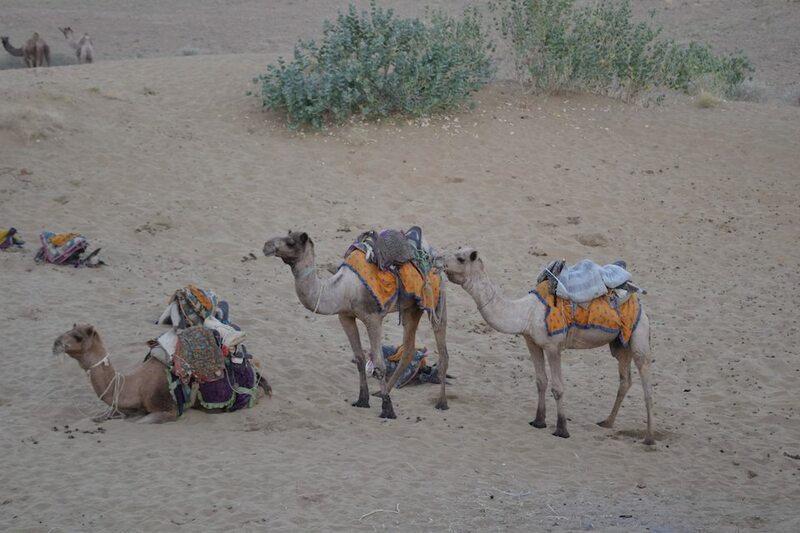 I am also having the same issues and everything I research about desert travel in Jaisalmer basically involves camels. Do you recommended any companies for camel safari. I’m still looking for non-animal trips with overnight stays in the desert. I also went to ENP in Thialand and this was a massive eye opener, I also wanted to ride an elephant when younger but so glad when I went to ENP when I was older and more aware of everything. Thanks for the great post and info on SPANA. We also went to ENP and were conflicted on riding a camel in an upcoming trip. The Holiday Hooves Guide is great. Will definitely share… As traveler we need education and awareness. Keep being awesome and have an epic 2018 ! Hi Elsa, thank you for your comment. We definitely need to educate (ourselves and others) and awareness! Great post guys! Like the other commenter I also stayed at the Elephant Nature Park and seeing how damaged some of the elephants are because of the terrible treatment they have endured for tourism is awful. But I have definitely questioned the use of some other animals (like the small, skinny horses that do carriage rides in some parts of Nicaragua). I think you are perfectly right though – a loving and respectful owner who puts the animal’s welfare as top priority makes all the difference. Thank you Freya! I (Lisanne) also went to ENP, such an eye-opener. It is terrible to see how they have been mistreated. Thanks for your thoughts! I love this post! I find myself in a quandary with some activities – like as far as I can tell, camel riding on the whole should be okay, but some of the exploitation for tourism purposes are obviously not. Much like carriage driving, which my parents actually do here in Scotland and treat the horses really well (they are basically pets, not money makers), don’t do tours too often so they can rest, can tell if they’re getting unhappy etc etc. I used to want to ride an elephant and for that I’m SO glad I was older when I travelled otherwise I might have done it. Instead I volunteered at ENP in Thailand and it was easily one of the best experiences of my travels – riding one would not have been! Thank you for your insight Clazz! I agree that certainly a lot of animals are treated very well, even when they are used as a tourist attraction. They don’t have to be necessarily hurt and live a good life! I am so grateful for people like your parents. I (Lisanne) did the ENP in Thailand too, such an eye-opener! I love this blog post! I was debating the same thing internally just a few weeks ago as I contemplated the ethics behind camel riding in the desert…it always looks like a beautiful experience but I know I wouldn’t ride an elephant so it was quite a conflict for me. I’m definitely going to share this as it contains a lot of useful tips, as well as some very serious food for thought! Thanks for the comment Aisha! We had the exact same thing with camels. It makes the difference knowing how to choose whether to ride an animal or not (by checking if they are treated good). With elephants this is different, as they are too wild to be a tourist attraction. So if they are obedient now, they have been tortured in the past. It’s true one must be very careful with animals activities… Since I’ve been to Australia & swam with wild dolphins & saw so many free animals, I really understood how a shame it is to train animals to do unnatural things for touristy reasons.. Thank you Umberta. It’s hard sometimes to know exactly what is ethical and what is not when it comes to wild life. There is a lot of room for thought with recreation such as a zoo (just an example). We all consider it so normal (me too), but is it really good for certain wild life to live there in cages? There is awereness now about elephants and we now know with a lot of animals its better to watch them in the wild (such as dolphins) where they are roaming free. PS: you should make a Pinterest pin! I am into a great board about responsible travel and I would like to share! Thank you so much! Happy to hear. Will definitely make a pin (having issues with Canva…), will let you know once it’s up. Totally agree that it’s fine if you are sure that the animals are treated well!